Alberta’s economy has seen tremendous economic growth, but the lion’s share of that growth has been benefiting private corporations. Corporate profits more than doubled their share of the economy from 1989 to 2008, rising from 9.6% to 22.6%. Relatively little of the meteoric rise in profits was captured by corporate taxes as can be seen in Figure 1. At both the federal and provincial levels, corporate tax cuts have been all the rage. Each jurisdiction is attempting to outdo its neighbours in order to attract mobile capital investment. This is a competition no jurisdiction can win as corporate tax and thus government revenues spiral down everywhere. The combined federal/provincial general corporate income tax rate has fallen from 33.62% in 2005 to 28% today and is set to decline to 25% by 2012. The small business tax has also declined from 30% to 14% (Table 1). Alberta’s Tory government has been leading the nation’s race to cut corporate taxes. Between 2001 and 2006, the general corporate income tax rate was reduced from 15.5% to 10%. The small business rate was cut in half, to 3%, and the small business income threshold was doubled to $400,000. Direct government spending creates far more jobs per dollar than tax cuts (Table 3). Government spending on health care or infrastructure is more effective at creating jobs because that spending directly employs people who then spend most of their income locally on goods and services, creating more spin-off jobs.2 Corporations do not automatically hire workers when they have money, much of that tax cut will be lost to payouts to shareholders (some foreign), debt payment, higher CEO salaries and other non-employment based activities. Instead of investing, Canada’s corporate sector is sitting on a growing pile of cash. The nonfinancial corporate sector had accumulated $489 billion in ready cash by the third quarter of 2010. Another reason corporate income tax is particularly important in Alberta is to capture economic rent from the use of natural resources that may have slipped through the Alberta’s inadequate royalties scheme. This is critical in the context of the wealth being generated and not captured from Alberta’s oil and gas industry, much of it by foreign corporations. The budget for 2010-11 estimated the general corporate tax revenue at $2.822b at the 10% rate. This means that for each percentage of tax the province is collecting $282.2 million.4 Accordingly, if Alberta raised its general rate to 12% it could raise roughly an additional $564.4 million per year in corporate tax revenue. Though BC’s rate is lower, debate in BC about reinstating it to 12% opens the door for a similar debate in Alberta. This rate would thus be still low enough relative to other provinces that it would not likely be significantly reduced by corporations declaring their revenues elsewhere in Canada, and the US combined tax rates are significantly higher. Alberta could capture significantly more of the corporate profits if it targeted the extraordinary profits being made in the oil and gas sectors. There is a precedent for a higher corporate tax rate for oil and gas. In 2001 the federal government began cutting the corporate income tax rate but left it at the higher rate for resource companies for an additional two years.5 The United Kingdom has a higher corporate rate for petroleum companies than for other companies. The oil and gas extraction sector paid a real tax rate of 6% of profits in 1999 to 18% in 2008. The incentive created by having a lower small business rate is that larger corporations hive off into smaller units to take advantage of the lower rate. Individuals also incorporate to avoid higher personal income tax rates. Making the rates consistent across corporations regardless of size would create a more effective and fairer regime for progressively capturing both personal and corporate incomes. As long as that rate is paid on profits, small businesses that operate close to the line would not be particularly hard hit by a higher tax rate. Public opposition to the corporate tax cuts has been significant and consistent. In January, Leger Marketing found only 10% of respondents favoured the cuts, while 40% supported increased corporate tax rates. In early March, both CP-Harris Decima and Ipsos Reid polls found 59% opposed the cuts. In late March, Forum Research reported more than 60% opposed.9 When faced with a choice between social program cuts such as health care and education and tax increases, polling consistently shows the majority support increasing taxes. 2. Many mainstream economists have been clearly advocating spending over tax cuts as economic stimulus. These include: Benjamin Tal, “Capitalizing on the upcoming infrastructure stimulus,” Occasional Report #66, CIBC World Markets, January 26, 2009. Matthew D. Shapiro, Joel B. Sherrod, “Did the 2008 Tax Rebates Stimulate Spending?” working paper #14753, National Bureau of Economic Research, Cambridge, MA, March 2009. “Tax refunds to go to debt, investments, suggests poll,” Financial Post, Ottawa, March 3, 2009. Glen Hodgson, “Permanent tax cuts are no panacea,” Globe and Mail, January 12, 2009. 3. For a more detailed discussion of the disconnect between corporate taxes and investment, see Having Their Cake and Eating It Too: Business Profits, Taxes, and Investment in Canada: 1961 Through 2010, Jim Stanford, Canadian Centre for Policy Alternatives, April 2011. 4. 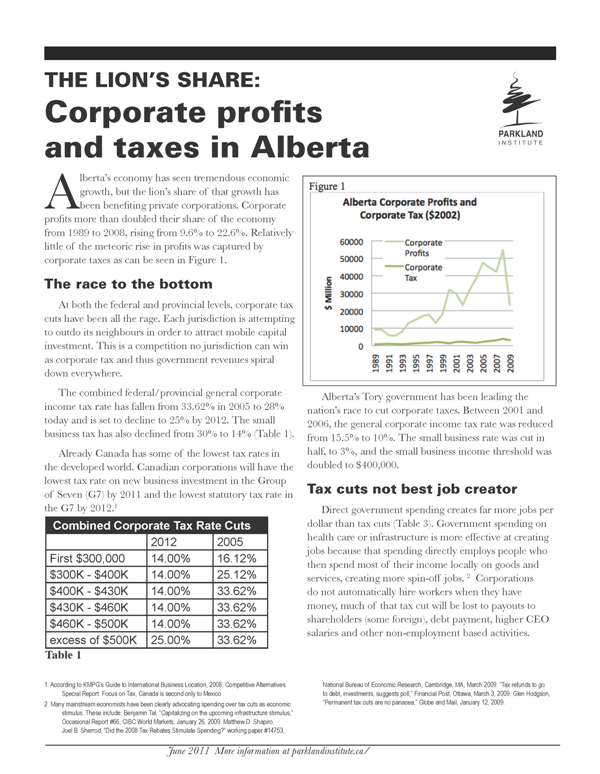 Government of Alberta, Budget 2010, Striking the Right Balance, Tax Plan, p155. 5. Finance Canada, Budget 2003, p. 185 (table 3.8) as referenced in the CCPA Alternative Federal Budget 201 “Getting the Job Done Right” p. 28. 6. Erin Weir, “The Treasury Transfer Effect, Are Canada’s corporate tax cuts shifting billions to the U.S. Treasury?”, Canadian Centre for Policy Alternatives, 2009. 8. Kevin S. Markle, and Douglas A. Shackelford, Cross-country Comparisons of Corporate Income Taxes, Working Paper 16839, National Bureau of Economic Research, Cambridge, MA, February 2011. 9. Majority has spoken - scrap corporate tax cuts, (May 5, 2011) Canadians for Tax Fairness.